Thanks. What variant are they using for them ? 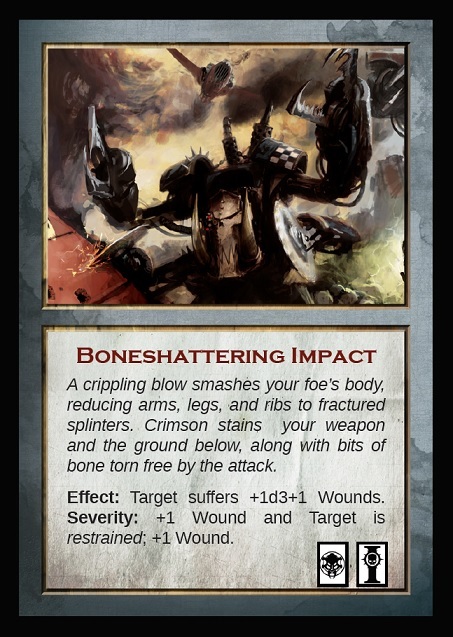 Cards with colour pictures like lets say the Torg Eternity deck or are they pure rule text cards like for example the skill or equipment cards Ulisses does for their games ? Sold. Those will be fun at my table. The critical hits looks a bit samey, honestly. A grisly description and the target takes some mortal wounds. Only some of them have extra effects. But we haven't had a critical hit in my game yet.